Last night the COC began its run of Götterdämmerung, the last and longest opera in Wagner’s epic tetralogy at The Four Seasons Centre. It’s very different from Die Walküre and Siegfried. The visual elements that tied them together; tottering Valhalla, disintegrating world ash, gantries, dancers, heaps of corpses are mostly gone. In Tim Albery’s production the visuals are spare almost to abstraction. The Gibichung Hall is a CEO suite with computer monitors and red couches, both Brünnhilde’s rock and the Rhinemaidens’ hang out look improvised, almost like squatters’ camps. Costuming, apart from an occasional flashback, as in Waltraute’s scene, is severely modern business; grey suits, black dresses. Only Siegfried himself in tee shirt and leather jacket stands out from the corporate crowd. Dancing flames are replaced by red lights. Everything that can be understated is and the world ends not with an overflowing Rhine and collapsing Valhalla but a stately pas de quatre between Brünnhilde and the Rhinemaidens. 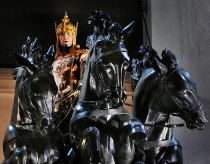 François Girard’s Siegfried, a revival of his 2006 production, opened last night at the COC. Despite using the same basic set concept as Atom Egoyan’s Die Walküre, Girard’s Siegfried, has a rather different look and feel. The fragments of Valhalla and the remains of Yggdrassil are still there but they are supplemented in imaginative fashion by a corps of supers and acrobats who play a key role in shaping the scenes. For example, in the opening scene we have Yggdrassil festooned with bodies, as if some enormous shrike were in residence. Some of these are dummies and some aerialists who come into the drama at key points. The flames in Siegfried’s forge are human arms. 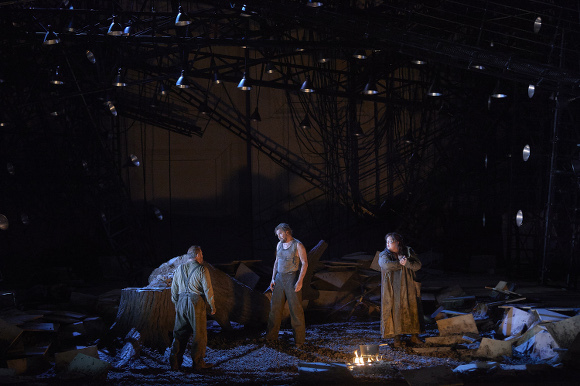 Acrobats make a very effective Fafner in the Niedhöhle scene and the flames around Brünnhilde’s rock are human too. Most of the characters are dressed in sort of white pyjamas which makes for a very monochromatic effect on the mostly dark stage. The one visual incongruity is the “bear” who is present, tied to Yggdrassil, throughout Act 1. Frankly it looks less like a bear than John Tomlinson after a night on the tiles. Still, all in all, the production is effective without being especially revelatory. This just in from frequent Operaramblings commenter and COC Adult Education Programs Manager Gianmarco Segato. The COC is launching Opera Insights, a series of free adult education events linked to the productions of the 2015/16 season. It’s a pretty broad range of programming ranging from scholarly discussions on reconstructing the score of Maometto II and the history of the ball gown to Traviata singalongs and Carmen themed dance lessons. Participants include composers Barbara Monk-Feldman and Norbert Palej, conductors Johannes Debus, Harry Bicket and Sandra Horst and singers like Christine Goerke plus, inevitably, lots of academics (we love them really we do). Looks like a lot of fun. The events are all free but are ticketed. Full details can be found here. 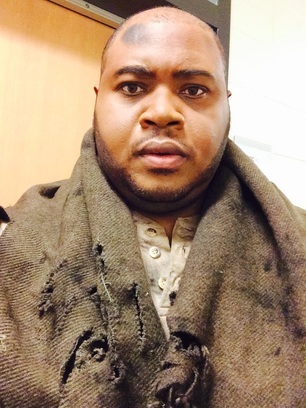 I was back at the Four Seasons Centre last night to have another look at the COC’s Die Walküre. The big news, which I heard pretty much as soon as I arrived, was that cover Issachah Savage would be singing Siegmund in place of an indisposed Clifton Forbis. This time, unlike last Saturday when he also sang, this was very much a last minute call. The reviews and the word on the street, and from my companion for the evening who had seen him in Seattle when he won the International Wagner Competition last year had been very positive so I was very interested to hear him. Clearly word had got out about his Saturday performance because when the announcement was made in the hall there was a curious ambiguous noise not at all like the collective sigh that usually greets such news.